Is joint pain holding you back? Perhaps an achy ankle or sore knee is making it difficult to enjoy a run through your favorite park or even taking a short walk. Or maybe a throbbing hip or shoulder prevents you from whacking a golf ball or performing simple tasks like carrying a bag of groceries. 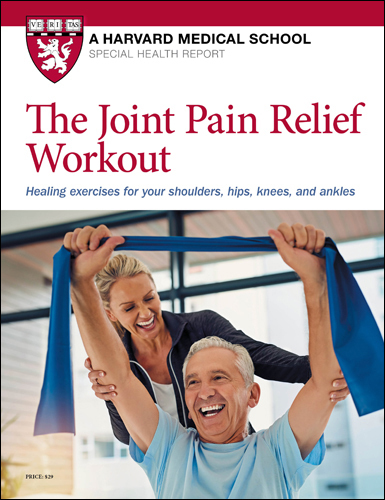 The exercises in this report, The Joint Pain Relief Workout: Healing exercises for your shoulders, hips, knees, and ankles, can help relieve ankle, knee, hip, or shoulder pain, and help you become more active again, which can help you stay independent long into your later years. Is joint pain holding you back? Perhaps an achy ankle or sore knee is making it difficult to enjoy a run through your favorite park or even a short walk? Or a throbbing hip or shoulder prevents you from driving a golf ball down the fairway or from performing simple tasks like carrying a bag of groceries into your home? The exercises in this report can help relieve ankle, knee, hip, or shoulder pain, and help you become more active again, which in turn can help you stay independent long into your later years. Designed by knowledgeable exercise experts, our workouts are intended to strengthen the muscles that support your joints, increase flexibility in your joints, and improve range of motion. Done regularly, these exercises can ease pain, improve mobility, and help prevent further injury. The Joint Pain Relief Workout includes four workouts targeting your ankles, hips, knees, and shoulders. You’ll find detailed instructions for each exercise, as well as information on how to adapt each exercise to make it either harder or easier, so you can tailor it to your ability. In addition, the report includes mini-workouts to address wrist and elbow problems, a planning worksheet to help you get started and stay motivated, and answers to common exercise questions. How much exercise should you aim for? Maintaining proper posture and alignment. If you haven’t been working out regularly, or even if you have, you may have some questions about getting started on the workouts in this report. Here we answer some common questions. 1. Which workout should I do? That depends on which joints are bothering you. If it’s an ankle, turn to “Ankle workout”; if it’s your hips, turn to “Hip workout.” What if it’s both? It’s safe to do both routines as long as the problems you’re experiencing are described in the workout introductions. If you have more significant joint problems, or if you have any doubts, see your doctor before you start any workout! Pair the workout or workouts you choose with the weekly walking program or another choice to get the cardio tune-up your body needs. 2. What if I can’t do all the reps or sets suggested? Quality is much more important than quantity. While you want to challenge yourself, it’s okay if you can’t do all the recommended reps or sets at the start. Begin by trying to finish a single set of each exercise in the workout, then gradually work up to more as you progress. Within any set, only do as many reps as you can manage while following instructions, maintaining good form, and sticking to the specified tempo. If necessary, try lightening up the weight or resistance to make this possible. 3. How much weight or resistance should I use? It’s wise to have a selection of light weights (1, 2, and 3 pounds) and resistance tubing or bands (light through medium resistance). achieve a full and pain-free range of motion. Wait until you find it easy to meet all four requirements before you increase the weight or resistance for a particular exercise. If it’s difficult to meet any of the four, decrease the weight or resistance. As you try the exercises, you’ll find some muscle groups are stronger than other groups. Thus, you’ll need to vary the amount of weight or resistance used in the course of your workout. 4. How often should I do the exercises in a workout? A full workout incorporates warm-ups, muscle strengthening exercises, and stretches. We recommend doing full workouts two to three times a week. Strenuous exercise like strength training causes tiny tears in muscle tissue. The muscles grow stronger as the tears knit up. Always allow at least 48 hours between strength training sessions to give the muscles time to recover. Warm-ups and stretches can be done more often—even daily—to enhance flexibility.